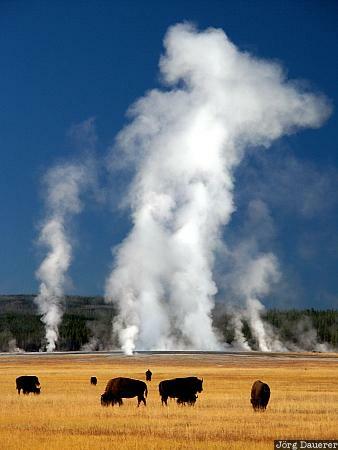 A herd of grazing bisons in front of steam from the thermal features of Midway Geyser Basin in the southern part of Yellowstone National Park. I saw the herd of Bisons grazing when I passed by on the way back to the hotel after taking photos in the early morning. Yellowstone National Park is in the north-western corner of Wyoming, United States. This photo was taken in the morning of a sunny day in September of 2003. This photo was the image of the month in June of 2010. This photo was taken with a digital camera.